The mysterious hexagon at Saturn’s northern pole has changed colour from blue to gold – and no one knows why. Images captured by a wide-angle camera between 2012 and 2016 show a bluish halo over Saturn’s north pole turning into a more golden hue. The observation was made by Nasa’s Cassini spacecraft, which has been orbiting the sixth planet since 2004. The hexagon (which is now gold instead of its usual blue) is essentially a rotating cloud pattern, and the change in colour is thought to be the result of seasonal changes on the planet, but scientists are still investigating. 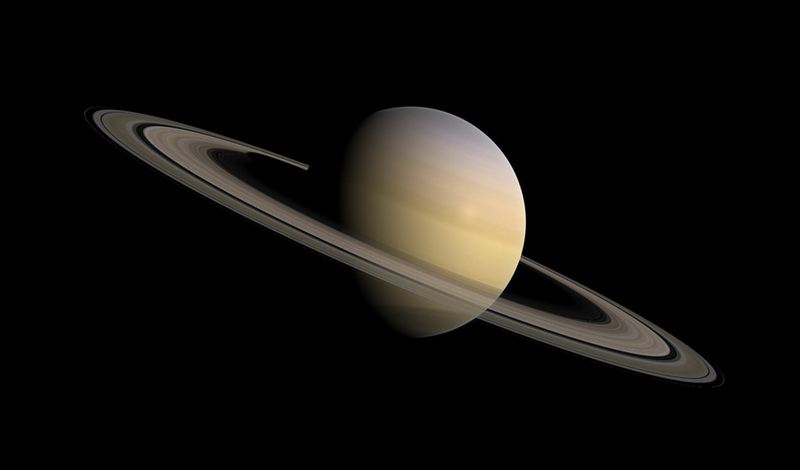 The color change is thought to be an effect of Saturn’s seasons. In particular, the change from a bluish color to a more golden hue may be due to the increased production of photochemical hazes in the atmosphere as the north pole approaches summer solstice in May 2017. To get technical, photochemical hazes – or aerosols – are created from reactions between sunlight and the atmosphere. Saturn experienced equinox in August 2009, and since then has been subjected to continuous sunshine, according to Space.com. During this time, photochemical aerosols have accumulated in the sky above Saturn’s north pole, creating the golden haze. But other factors, like changes in wind patterns and solar heating, could cause a shift in the planet’s atmospheric circulation, officials said in the statement. And those factors may also be why Saturn has changed colour. So while we still don’t know for sure, Saturn’s seasons is thought to be behind the gold hue. And researchers will continue to study data collected from Cassini to get a better understanding of the colour change.